Diabetes is a complex endocrine disorder where the body either does not secrete enough insulin or the body’s tissues become resistant to insulin. Insulin is required for cells to uptake glucose, which is required for energy. With diabetes, the body essentially goes into a starvation state since it is not able to use the energy (in the form of glucose) available to it. Diabetes comes in two forms. Type I diabetes occurs when the pancreas does not produce enough insulin for the body to function. This can be caused by inflammation of the pancreas (pancreatitis), immune disorders and inherited disorders. This is the type we commonly see in dogs. Type II diabetes occurs when the pancreas is able to produce insulin, but the body becomes resistant to it. This occurs as a result of obesity/inappropriate diet and is the type we commonly see in cats. 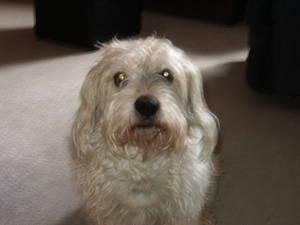 What are the signs my pet may have diabetes? Your veterinarian will perform a thorough history taking and physical exam which may make your pet highly suspicious for diabetes. However, diabetes can look like other issues such as thyroid and kidney disorders. So, your vet will likely need to perform bloodwork and a urinalysis. The key indicator of diabetes is very high glucose in the blood and glucose present in the urine. The urinalysis will check for urinary tract infections as well (which are very common in diabetic animals). Diabetes is treated with insulin. Insulin comes in many different types. The insulin type your veterinarian chooses will be specific to your pet. Insulin treatment requires regular glucose monitoring as well, which will also be discussed with you. This monitoring may be able to be performed at home. If your pet is a Type II diabetic, a diet change may also be required. While the idea of giving insulin injections may seem intimidating, most animals tolerate them surprisingly well. What is the prognosis of diabetes? With treatment, diabetic animals can live long, healthy and happy lives. Regular monitoring will decrease the risk of secondary complications such as hypoglycemia or urinary tract infections. Cats (when placed on a proper diet) can even go into remission and may be able to discontinue their insulin. Without treatment, the prognosis is poor as the body is essentially starved of energy. This eventually causes an emergency medical condition called Diabetic Ketoacidosis (DKA). DKA requires hospitalization and intensive care, and some animals do not recover. If you notice that your pet seems to be urinating or drinking more than usual, see your veterinarian right away. The sooner your pet is treated, the better your vet can control the diabetes. 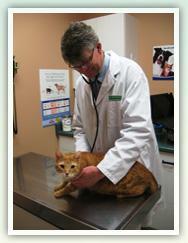 Give our team at Coventry Animal Hospital a call if you have any questions or concerns about your pet.